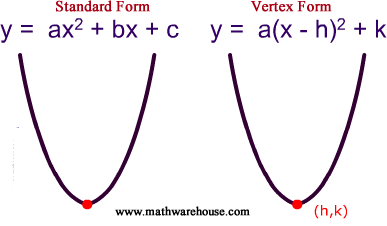 ﻿ Standard and vertex form of the equation of parabola and how it relates to a parabola's graph. 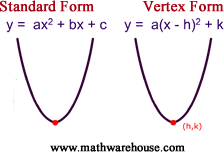 The equation of a parabola can be expressed in either standard or vertex form as shown in the picture below. if $$ a < 0 $$ it opens downwards. If a is positive then the parabola opens upwards like a regular "U". If a is negative, then the graph opens downwards like an upside down "U". 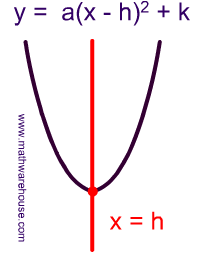 If |a| < 1, the graph of the parabola widens. This just means that the "U" shape of parabola stretches out sideways . 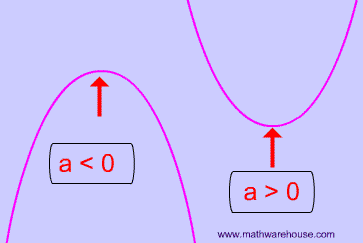 Explore the way that 'a' works using our interactive parabola grapher. 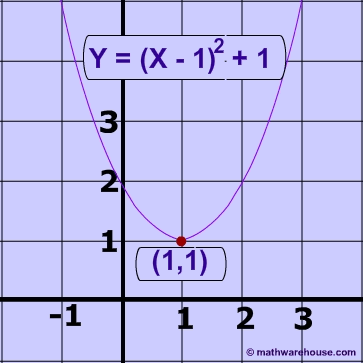 If |a| > 1, the graph of the graph becomes narrower(The effect is the opposite of |a| < 1). 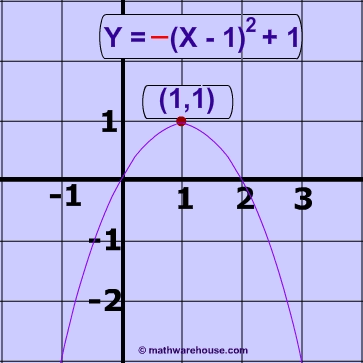 What is the graph of the following parabola y = (x–1)² + 1? 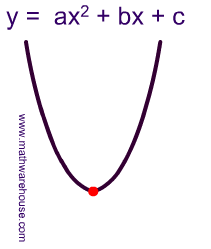 The parabola's vertex is the point (1,1). 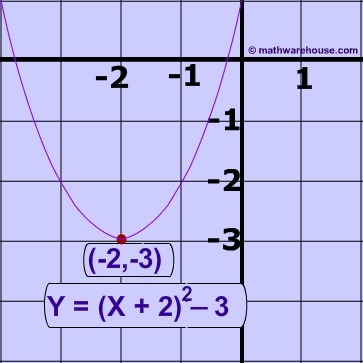 What is the graph of the following parabola y = –(x–1)² + 1? 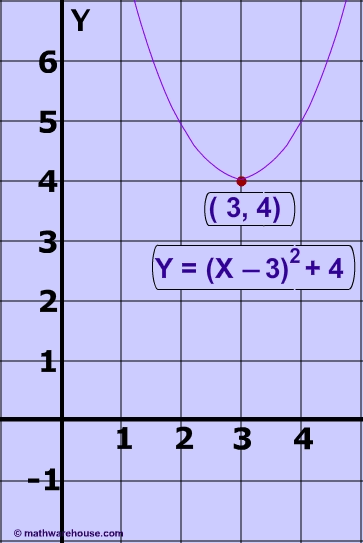 What is the graph of the following parabola y = (x+2)² –3? y= 2(x-3)2+4 ? Does the parabola open upwards or downwards? 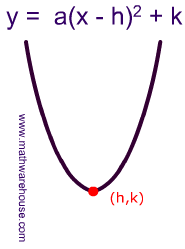 The vertex is (3,4) and it opens upwards since a is positive( it is 2), it opens upwards. If a parabola's equation is y = 3(x+3)2 +4, what is its vertex? Which way does it open? 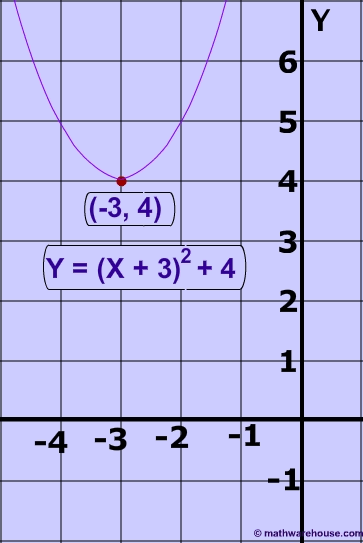 Vertex = (-3,4), and it opens upwards since a is positive. 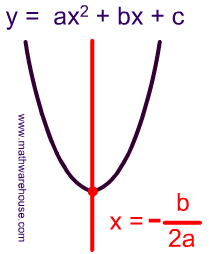 A parabola has the equation y = -22(x - 9)2 + 5. What is its vertex? Which way does the parabola open? Vertex = (9, 5) and since a is negative (it is -22), it opens downwards.